KarlKnechtel: In order to live, Black must either make two eyes out of the circled points, or one out of those and one at the squared point. The placement of prevents the first way right off the bat. 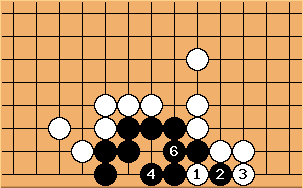 at would mean no eye at the squared point, so Black must play there to have any hope. threatens to falsify the eye at b, but Black cannot play there because of shortage of liberties. Without , the play at b would be possible. Thus is a dual-purpose move of sorts - well, it accomplishes two things, but both are oriented towards killing the black group, so I don't know if you'd count that. If Black captures the stone with a, White goes ahead with at b to falsify the eye. Can White kill this way? does not work, since saves the black group (this is Black's only move!). 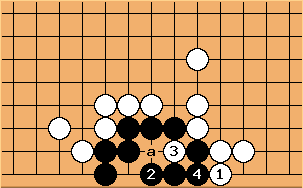 Note that playing to capture at a is wrong, since then at falsifies black's eye. 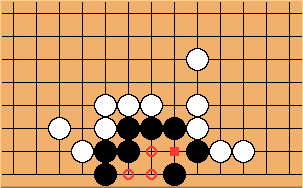 This one doesn't work either - a and b are miai for Black to live. Alternately, White a can be answered at c, removing a tiny bit of aji (after the a-b exchange, White could kill with three local moves in a row). Not worth the one-point sacrifice, probably. Not at my level of play anyway. Grech: What if White calls the tune like this? Stefan: Black should answer differently. If he answers the atari at at here, White may capture one stone in ko, but the rest of the black forces survive if Black calmly makes the second eye at . unkx80: is incorrect, but after that the placement at still can create a ko. letsgo4it? : I believe this also works. 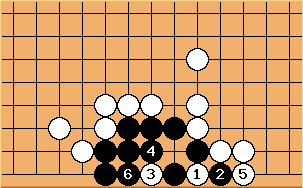 Even if Black plays elsewhere after 1, White can easily finish it off. fractic: This sequence doesn't work. 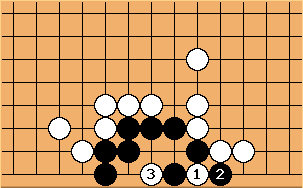 Black will live by playing at a next, it creates two real eyes at the . Fragnix? : I believe this also works. The key is to take the vital point 3. Black can't answer anywhere else but 2. However, this solution is suboptimal to the main solution. This becomes a ko fight, which is a failure for W since there exists a line which kills outright. The exchange is bad for W, as the only thing it seems to accomplish is setting up a ko fight around .